Duurzaam bouwen: Wil jij meedoen aan de bouw van Aardehuizen in Olst? Het aardehuis-concept is een schoolvoorbeeld van milieubewust en duurzaam bouwen en wonen. Alle milieuaspecten komen in deze vernieuwende en tegelijkertijd simpele (low-tech) bouwmethode aan bod. Door het hergebruik van materialen bij de constructie en schone energiewinning is de CO2-uitstoot en dus het schadelijk effect op het milieu minimaal. Hergebruik van liefst lokaal aanwezige materialen maken aardehuizen goedkoop om te bouwen. Door de goede isolatie en warmtebenutting is de energierekening erg laag. Vereniging Aardehuis Oost Nederland realiseert in Olst een voor Europa uniek project: een ecowijk van 23 ‘aardehuizen’ en een aantal daarmee verbonden projecten en ondernemingen. Een aardehuis is een geheel zelfvoorzienend gebouw dat goeddeels is opgebouwd uit lokaal aanwezige grondstoffen en hergebruikte materialen. Hier leest u meer over de werking van een aardehuis. De bouw van het wijkje met aardenhuizen (‘earthships’) in Olst (Ov) is begonnen! Op 28 april is er een informatiedag voor mensen die willen meebouwen. Met diverse praktische workshops. Op de bouwlocatie. Tijdig aanmelden. Het realiseren van het project Aardehuis in Olst kost de leden van de vereniging heel wat. In euro’s en qua inspanning. Alle hulp is dan ook van harte welkom, zowel tijdens de voorbereiding als straks tijdens de bouw. Gelukkig krijgen we uit het hele land hartverwarmende reacties van mensen die op de een of andere wijze willen helpen. Door mee te denken, het verrichten van hand- en spandiensten, of door ons financieel te steunen. Wil je meebouwen aan de Aardehuiswijk? We hebben een hele hoop werkervaringsplekken annex bouwstages te bieden! Wie zich wil verdiepen en bekwamen in het bouwen van aardehuizen, kan straks bij ons zijn hart ophalen. Op de pagina Meebouwen lees je wat er van je verwacht wordt èn wat je zelf kunt verwachten. Of meld je meteen aan via het aanmeldformulier. LISTEN FOR YOURSELF AT 22 MINUTES IN--A CONVERSATION HE IS HAVING WITH A BANKER AND THE BANKER BRINGS IT UP HIMSELF! Honestly, when I heard this short clip, my mind was “blown open” into a new understanding about this (and even after listening to this, my “blown open” brain, still appears to be working!). And that an actual banker would utter the words, “Prosperity Package,” is pretty astounding. By now, chances are the Iraq Dinar has veen ReValued. It aappears that not everyone is announcing the Dinar RV details. Many people have no idea that currencies around the world are being RV'd. Not all of the details have been nailed down yet. As quickly as more details come in, then further intel will be released. Recently CNBC did an article on several countries that were about to Re-Set their currencies. Go ahead and look it up. For some time now the IMF ran out of lendable currency. There are worl wide ramifications as the Iraq Dinar is RV'd. In the first place, if you are going to purchase IQD's don't spend money that you can't afford to lose. Make sure that you pay your bills and debts. As many countries will be re-setting the value of their currency it appears that their value will be based upon the natural resources in each country. Currently it appears that in China you can get $29 per Dinar, in the USA it's $14.38, in Canada it's set at $7 per Dinar and in Mexico the rate looks to be at $2 per IQD. Taxes may be calculated in to these IQD exchange rates, but we're not sure. Will the debt in every country be nulified? We're not sure. be destroyed in exchange for credtis for oil. According to Blaino's Banking source, some banks across America have received careful files which spell out the regulations and distribution details for the Prosperity Packages. Positive Expectancy is the best we can do until we have literally exchanged our Dinar for federal reserve notes or treasury dollars. all the assets of our country. This Global Re-Set is coming. The Dinar RV is imminent… Keep watching! An online call for peace initiated by an Israeli couple has managed to achieve the support of 1,000 Israelis and Iranians. And it all began with two posters. Ronny Edry and his wife Michal Tamir, together with "Pushpin Mehina", a small preparatory school for graphic design students, uploaded posters to Facebook depicting images of themselves with their children alongside the words, "Iranians, we will never bomb your country, we Love you." Attached to each poster was the caption, "To the Iranian people, To all the fathers, mothers, children, brothers and sisters, For there to be a war between us, first we must be afraid of each other, we must hate. I'm not afraid of you, I don't hate you. I don t even know you. No Iranian ever did me no harm." "I'm not an official representative of my country. I m [sic] a father and a teacher", wrote Edry, adding that he wishes to send a message on behalf of his neighbors, family, students and friends. "[W]e love you. We mean you no harm", he wrote. "On the contrary, we want to meet, have some coffee and talk about sports." In a conversation with Haaretz, Edry explained that he hoped his initiative would reach the Iranian citizens, but admitted that he never believed it would gain so much momentum. "On my Facebook page I have left-wing friends who always speak of these things; they all agree with me. Every so often a right-winger answers me saying what we're on about is rubbish, but I've never spoken to an Iranian." "I thought that when you're constantly surrounded by talk of threats and war, you are so stressed and afraid that you crawl into a sort of shell and think to yourself how lucky we are to also have bombs and how lucky we are that we'll clean them out first," he said. "So I thought, 'Why not try to reach the other side; to bypass the generals and see if they [Iranians] really hate me?'" At first, the posters were castigated, said Edry. "After the first poster people started criticizing me, saying I'm an idiot, that I’m naïve. 'Why are you telling them you love them? Why are you giving up before the war has even started?'" But very quickly the posters became a hit: the first image gained hundreds of "Likes" and "Shares," and numerous people asked to join the initiative. It was not long before reactions from Iranians began trickling through. "I never imagined that within 48 hours I would be speaking to the other side," said Edry, who explained that most of the Iranians' messages had been coming through in private, but that there had been some who invited him to be their Facebook friend. In a conversation that took place on Saturday evening, after a full day spent in front of the computer chatting to Israelis and Iranians, Edry was buzzing with excitement. "Something insane is going on here," said Edry. "I was just having a conversation with a few Iranians, trying to convince them to send me photos of themselves, and they told me that we [Israelis] might be able to publish photos, but they risk going to jail over such a thing." In the meanwhile, they conversed via private messages, with their identities concealed. However, by Sunday morning, Edry began receiving the first signs of reactions from the other side. "We also love you. Your words are reaching us despite the censorship," wrote one Facebook user from Iran. "The Iranian people, apart from the regime, do not hold a grudge nor animosity against anyone, especially not the Israelis… We never saw Israelis as our enemies. As such, the regime cannot gain public support for war." "The hatred was invented by the propaganda of the regime, which will die soon", continued the Iranian Facebook user. "The ayatollah will die soon. [Iranian President Mahmoud] Ahmadinejad will disappear. He is nothing more than an opportunist, and more than anything – an idiot. Everyone hates him. We love you, love, peace. And thanks for your message." By Sunday afternoon, faceless posters prepared by Iranians, sharing a similar message of thanks and love, were posted onto the Pushpin Mehina Facebook page and the "Israel Loves Iran" blog. 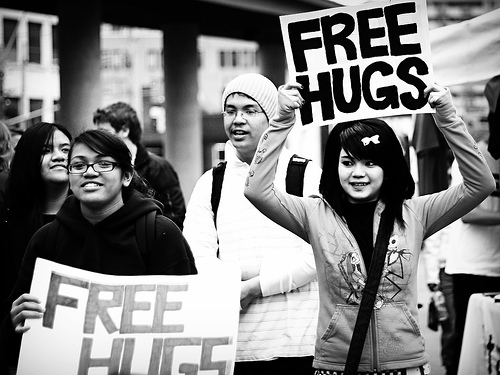 March 21st 2012 , the Worldwide Hug will be organized in many cities all over the world! Amsterdam, Den Haag, Berlin, Jerusalem, La Paz, Rome, Hiroshima, Cologne, Leiden, Melbourne, Maastricht, Utrecht, Lelystad, Nijmegen, Leipzig, Brazilia, Okinawa and also in every other village or town that might join this initiative. We are all part of the collective consciousness, connecting everything with all. We are able to heal our planet and unite everybody with each other in peace and tolerance. So let us demonstrate our unity, showing our fellow-men that we are all One, no matter what kind of religion, race or culture we represent. We are able to love and respect each other. Every individual person can participate in the Worldwide Hug. Just invite some friends in your home, club, gallery or community centre, on Wednesday, March 21 and focus together on peace and unity in yourself. You can share your personal stories, sing, dance and meditate. Make a human chain or do free hugs or a flash mob in the streets! Let’s show the world that Peace is possible. By opening the heart and show compassion, by doing instead of talking, by holding hands and hug from the heart. Because when you do that love will flow like sweet nectar. That is its only true purpose. That is the true meaning of the Worldwide Hug. Send your message for peace into the world. Use your webcam, share your stream and be connected to a worldwide network of people who join the Worldwide Hug! In this way the togetherness will be even stronger. Come and join us and let us fill the Universe with Love that is so strong that it will bring joy and peace in the hearts of everyone. We ask you to contact all your friends in the world in order to join a Worldwide Hug in their own city. The moment of the Worldwide Hug will be at 17:00 West European time, in Amsterdam, Berlin, Cologne and Rome. Simultaneously this World-Wide-Hug will take place in Jerusalem (18:00 p.m.), La Paz (12:00) and Hiroshima (01:00 March 22nd). Find out in what time zone your Worldwide Hug will take place and join us! Het in stand houden van een grote diversiteit gezonde, zelf reproducerende voedselgewassen ligt aan de basis van een veilige en diverse voedselvoorziening in Nederland. Daarom hebben Permacultuur Nederland en Spullen Delen de handen ineengeslagen om een planten- en zadenbank voor Nederland op te zetten waarin individuele tuinders de hoofdrol spelen. Het gaat in deze database om zaden, knollen en ander plantmateriaal van eetbare gewassen waar iedereen aan mee kan doen. Door slim gebruik te maken van de voordelen die het internet in deze tijd biedt worden mensen in staat gesteld om hun eigen planten en zaden gemakkelijk te delen. Wat vooral handig is, is de zoekfunctie op de site die mensen laat zoeken op afstand rond hun eigen woonplaats. Zo kun je als je op zoek bent naar een rode-bessenstruik of een bieslookplant eerst kijken of iemand in een straal van 1, 5 of 10 kilometer rond je woonplaats dit beschikbaar heeft. Momenteel ligt bijna alle diversiteit van zaden en planten bij professionele kwekers van zaden en planten die dit voor de commercie doen. Als dit bedrijven zijn met hart voor de zaak en als zij dit op een ecologisch verantwoorde wijze doen dan is daar niets mis mee. Echter helaas zijn er ook megabedrijven in deze industrie actief waarbij winst het enige doel lijkt te zijn. Deze bedrijven proberen de biodiversiteit van het leven zo veel mogelijk te monopoliseren en hiermee mensen afhankelijk van ze maken. Als dit eenmaal is gelukt is er een boel geld te verdienen door deze bedrijven. Hoewel dit als bedrijfsmodel prima werkt is het letterlijk levensgevaarlijk voor de bevolking. De algemene diversiteit in eetbare gewassen is de afgelopen decennia schrikbarend teruggelopen en deze grote bedrijven die vaak beursgenoteerd zijn en over veel lobbykracht beschikken weten zich in telkens meer onderzoeksinstituten en overheden in te kopen en zo hun eigen agenda erdoorheen te drukken. Wellicht het bekendste voorbeeld hiervan is Monsanto. Monsanto koopt wereldwijd zaadleverenciers op, halen de vaak grote diversiteit van zaden die deze zaadleveranciers leverden uit de handel en bieden vervolgens alleen hun eigen zaden nog op de markt aan. Dit zijn vaak zaden waar planten uitgroeien met onvruchtbare zaden zodat er het jaar daarna weer bij hun moet worden gekocht. Deze zaden zijn bijna altijd genetisch gemanipuleerd en zijn vaak bestand tegen bepaalde herbiciden die Monsanto ook verkoopt. Monsanto zorgt er zo voor dat boeren heel sterk al dan niet volledig afhankelijk van hun worden. Helaas heeft Monsanto ook in Nederland voeten aan de grond weten te krijgen onder meer door zichzelf in te kopen in de Universiteit van Wageningen. Via deze route hebben ze de Nederlandse overheid weten om te praten en is de Nederlandse overheid nu één van de partijen die (Monsanto`s) GMO gewassen promoot in Europa. Een weldenkend mens zal wellicht denken dat dit zo absurd is dat dit een grap is. Helaas is niets minder waar. Op het internet is een overvloed aan informatie te vinden over de schadelijke werkwijze van Monsanto. Een goede begindocumentaire gemaakt door een Franse onderzoeksjournaliste is: The World According to Monsanto. Maar deze bedreiging van onze biodiversiteit door dit soort megalomane bedrijven die aan niets anders denken dan winst ten koste van alles, is niet de enige reden tot dit initiatief. Inplaats van jezelf afhankelijk te maken van externe grote commerciële bedrijven, (om)koopbare onderzoeksinstellingen en ondoorzichte politieke processen kun je met dit initiatief zelf verantwoordelijkheid nemen en meehelpen om een grote diversiteit van eetbare gewassen veilig te stellen voor Nederland. -) Individuele tuinders groeien vaak hun eigen groentes en kruiden vanuit hun passie en/of hobby. Zij spenderen veel tijd met hun gewassen en hebben hart voor de zaak. Hierdoor weten zij verreweg het meeste van de zaden en planten die ze zelf groeien. Zij weten wat de beste groeiomstandigheden zijn voor de planten en welke gebieden juist heel geschikt zijn en welke juist minder om de planten te gaan groeien. -) Er zijn van oudsher verschillende bekende lokale variëteiten van gewassen ontstaan die bij commerciële zadenhandelaars zeer moeilijk of niet te krijgen zijn, maar nog springlevend zijn bij de volkstuinder in de regio. -) Volks- en hobbytuinders oogsten vaak al jaren hun eigen zaden uit de mooiste en best groeiende planten in hun tuin. Hierdoor krijg je varieteiten die speciaal zijn aangepast aan de regio. Veel betere zaden kun je eigenlijk niet krijgen. Ook krijg je hierdoor juist weer meer genetische diversiteit in de algemene soort. Als veel tuinders bijvoorbeeld zelf hun bonenzaden kweken dan heb je overal in de regio`s net wat andere bonenzaden en allemaal zijn ze zo goed mogelijk aangepast aan de eigen regio. Zo kunnen we de biodiversiteit juist weer uitbreiden. -) Zaden en planten ruilen van persoon tot persoon zorgt voor sociale verbindingen (in de regio). In onze maatschappij is dat altijd mooi meegenomen. Daarnaast kun je zo direct van de kweker van de zaden wat tips meekrijgen en wordt er naast zaden ook belangrijke informatie over het telen van eetbare gewassen uitgewisseld. Kortom het zijn juist de gewone tuinders die het uit plezier en hobby doen die het meeste verstand van zaken hebben en het meeste hart voor de zaak hebben. Door deze mensen te verbinden met elkaar en ze daarnaast te verbinden met welwillende mensen die graag gebruik maken van, en open staan voor hun kennis en planten, bouw je een sterk en solide netwerk wat de biodiversiteit en voedselveiligheid in Nederland sterk kan vergroten. Meedoen is dus niet alleen zeer nuttig, het kan ook bijzonder leerzaam en gezellig zijn. Hoe en waar kan ik meedoen? Ga naar www.spullendelen.nl, hier kun je je registreren en beginnen, deel de zaden, knollen en ander plantmateriaal van eetbare planten die je over hebt. Het is het meest praktisch om deze in de categorie “zaden, stekjes, planten, kruiden” aan te bieden. Ook kun je zelf zaden en planten krijgen van mensen die deze aanbieden. Ga naar “spullen” en bekijk daar vervolgens de categorie “zaai- & pootgoed“, hier kun je een uitgebreid aanbod van planten en zaden vinden. Bedenk dat het niet uitmaakt of een plant die jij overhebt al een paar keer wordt aangeboden, voeg de plant juist wel toe, zo kan het aanbod namelijk zo lokaal mogelijk zo groot mogelijk worden. Inmiddels zijn er al een flink aantal deelnemers en is er al een redelijke diversiteit aan planten beschikbaar. Echter het basisprincipe blijft dat hoe meer mensen meedoen en hoe meer planten er worden aangeboden hoe beter en bruikbaarder het systeem wordt. Daarnaast kun je helpen door dit initiatief bekend te maken; denk aan familie, buren, tuinclubs, volkstuinverenigingen, lokale, regionale en nationale media, politieke partijen, etc. Kortom iedereen die belang zou kunnen hebben bij dit initiatief. Hoe meer mensen in de eigen buurt meedoen hoe veiliger en beter je eigen situatie op dit punt wordt. Als er vele mensen in je buurt zijn die veel bruikbare planten en zaden aanbieden waar je over kunt beschikken dan is dat een van de meest waardevolle levensverzekeringen die je kunt hebben. Alle aandacht voor dit initiatief is zeer welkom en zo kunnen we met elkaar ervoor zorgen dat er niemand in Nederland bang hoeft te zijn om zonder gezonde eetbare planten te komen zitten. Dat resulteert in een plezierige en fijnere toekomst voor iedereen! Updated 3/9/12 Huge amount of resignations today. Special thanks to Gabriel at http://www.facebook.com/MassResignations and to Sophie for the numerous additions for Septermber, October, January and February. There are also quite a few news ones for today. I don’t mind if you re-blog this listing. Save yourself the wear and tear on your karma and do me the favor of including http://americankabuki.blogspot.com in your reposting. Thanks to all who have caught minor errors. Special thank to Gabriel at Facebook Global Mass Resignations for some resignations I did not find in my searches. 9/20/11 (SCOTLAND) SCOTTISH WIDOWS (RETIREMENT INVESTMENT SAVINGS FUND) There could be no Scottish representative on the board of Lloyds Banking Group, owner of Bank of Scotland, in future after it announced the departure of Lord Sandy Leitch, the chairman of Scottish Widows and group deputy chairman. 9/29/11 (JAPAN) BLIFE Investment Corporation, Asset Manager Director Masaomi Yamadaira resigned. 10/03/11 (INDIA) The of Euram Bank Asia, presidentArun Panchariya, has resigned after being implicated in a stock trading scandal in India. 10/03/11 (USA FL) Quantek Opportunity Fund, portfolio manager Javier Guerra. Arbitration awarded $1 million damages to Aris Multi-Strategy Fund. Quantek Asset Management made false statements to Aris. 10/05/11 (UK) UBS co-chief François Gouws of global equities had resigned after last month’s revelation of a $2.3 billion loss from unauthorized trading. 10/05/11 (UK) UBS co-chief Yassine Bouhara of global equities had resigned after last month’s revelation of a $2.3 billion loss from unauthorized trading. 10/11/11 (CHINA) China Construction Bank Non-Executive Direct Sue Yang resigns for personal reasons. 10/14/11 (USA TX) Deutsche Bank Investment AdvisorGriffin Perry resigns, SEC regulations prevented him from campaigning for his father Rick Perry’s Presidential campaign. 10/23/11 (USA) Fairholme Capital Management LLC, Director Charles Fernandez stepped down for personal reasons. Fairholme Fund has lost 26 percent of its net asset value due to bets that have backfired on AIG Inc, Bank of America Corp and Florida-based landowner and developer St Joe Co.
10/24/11 (SINGAPORE) Keppel Corporation Limited, Teo Soon Hoe will resign from his role as group finance director Jan 1. 10/26/11 (INDIA) Beed District Bank (Coop Bank) CEO B S Deshmukh arrested for embezzling Maharashtra State Electricity Distribution Company Ltd payment deposits. 10/26/11 (INDIA) Beed District Bank (Coop Bank) former CEO A N Kulkarni arrested for embezzling Maharashtra State Electricity Distribution Company Ltd payment deposits. 10/27/11 (USA NY) Keefe, Bruyette & Woods Inc (KBW) CEO John Duffy stepped aside. Duffy has prostate cancer. 10/31/11 (BELGIUM) European Central Bank PresidentJean-Claude Trichet, resigns. 11/04/11 (USA NY) MF Global, Jon Corzine, stepped down as chairman and CEO, hired criminal attorney to represent him. 11/15/11 (USA NY) Icahn Enterprises LP, senior managing director of health-care investing, Alex Denner, has resigned. 11/17/11 (NETHERLANDS) Syntrus Achmea (pensions manager), CIO Marjolein Sol is resigning. 12/03/11 (USA SC) South Carolina’s $25 billion pension fund chief investor Robert Borden resigned. Borden’s resignation comes as the SC Retirement System faces a $13 billion deficit, prompting state lawmakers to call for a massive overhaul of the system. 12/06/11 (USA ) Western Liberty Bancorp CFO George Rosenbaum has resigned. 12/08/11 (USA) Fidelity Global Special Situations Fund, manager Jorma Korhonen resigned. 12/20/11 (USA MA) Century Bancorp, Inc., DirectorRoger S. Berkowitz resigned. 1/03/12 (USA WI) Michael Falbo, president and CEO of Southport Bank, has resigned just six months after accepting the position. 1/03/12 (UK) Arbuthnot Banking Group: Atholl Turrell left the Board. 1/07/12 (UK) Arab Banking Corporation Intl. Bank (ABCIB) Manama, Bahrain: ABCIB announced retirement of CEO Nofal Barbar from its London office. 1/17/12 (HONG KONG) Oversea-Chinese Banking Corporation Limited (OCBC Bank) CEO David Connerretires. 1/19/12 (UK) Santander, senior director Americas division Francisco Luzón is retiring with a pension pot of about €56m, a package whose generous size is expected to reignite controversy over bankers’ remuneration. 1/19/12 (EGYPT) Beltone Financial Holding (BTFH) Alaa’ Sabaa resigned from board of directors. 1/19/12 (EGYPT) Beltone Financial Holding (BTFH) Wael EL Mahgary resigned from board of directors. 1/21/12 (SINGAPORE) ANZ Asia’s private banking headNina Aguas resigns as managing director of Asia-Pacific private banking. 1/27/12 (SOUTH AFRICA) ABSA Group CEO Daphne Motsepe retires at the end of April after a 10-year career at the bank. 2/02/12 (USA) American Perspective Bank, President and CEO Thomas J. Beene resigned. 2/03/12 (UK) VinaCapital Vietnam Opportunity Fund Ltd, Non-Executive Director Horst Geicke has resigned. 2/03/12 (UK) UBS London trader, Kweku M. Adoboli, was arrested and charged with fraud and false accounting, forcing UBS to announce a $2.3 billion trading loss. 2/09/12 (UK) Alliance Trust Savings (ATS), Robert Burgess is stepping down as CEO. 2/13/12 (UK) Goldman Sachs confirmed on Monday thatGeorge N. Mattson, one of the firm’s top deal makers in the industrial sector, will retire. He was a senior relationship banker with a client list that included General Motors, General Electric and Caterpillar. 2/14/12 (USA NY) Goldman Sachs Jeffrey Moslowresigns, an investment banker to companies such as Tyco International Ltd, Nstar, the Boston-based utility, and defense contractor Dyncorp International Inc.
2/15/12 (CHINA) Morgan non-executive chairmanStanley Stephen Roach will be retiring. 2/16/12 (USA IL) Deerfield Capital Management LLC, CEO Daniel Hattori and CEO of CIFC Corp resigned. 2/16/12 (USA IL) Deerfield Capital Management LLC, COO Luke Knecht and CEO of CIFC Corp, resigned both positions. 2/17/12 (UK) Insight Investment, asset manager Mike Pinggera has resigned..
2/21/12 (JAPAN) CITIBANK JAPAN: Bakhshi is taking over duties from Brian Mccappin, who the bank said in December would resign after the unit was banned for two weeks from trading tied to the London and Tokyo interbank offered rates. 2/22/12 (UK) UBS AG’s (UBSN) Doug McCutcheon, head of Healthcare Banking in Europe, Middle East, Africa and Asia-Pacific region, has left Switzerland’s biggest bank after 25 years at the firm. 2/23/12 (UK) Goldman Sachs Nordic M&A banker Luca Ferrari has decided to retire from the firm, clients included the largest telecommunications operator in Spain the Spanish telecommunications. 2/23/12 (SCOTLAND) Royal Bank of Scotland Group director John McFarlane resigns. 2/24/12 (GUERNSEY) Spearpoint Limited (SPL) Investment Funds, director Mike Kirby resigns for business reasons. 2/27/12 (IRAN) Bank Melli CEO Mahmoud Reza Khaavari Resigns - Flees to Canada! 2/28/12 (BELGIUM) KBC’s CEO Jan Vanhevel is to retire after a career spanning 41 years. 2/29/12 (GUYANA) National Investment and Commercial Investments Ltd. (NICIL), Executive Director Winston Brassington resigns, “We feel that (Winston) Brassington knows everything…A to Z about all the transactions,” said Chairman of the Alliance for Change (AFC), Khemraj Ramjattan, as he sounded a warning thatcontroversial figure could be subpoenaed to appear before the Parliamentary Economic Sector Committee. 3/01/12 (ITALY) Italian Banking Association Chairman Giuseppe Mussari talks to reporters in Rome after he and seven other executives offered to resign in protest over new banking-fee rules included in the government’s legislation on boosting competition. 3/01/12 (SINGAPORE) UBS Singapore - James Tulley is leaving Switzerland’s largest bank, it is not clear where he is going. 3/02/12 (USA NY) Deutsche Bank Student Loan CEOJohn Hupalo quits to start student loan counseling firm. 3/02/12 (UK) Bank of England Sir Mervin King resigns in June, Lord Sassoon tipped as replacement. 3/03/12 (RUSSIA) Enza Capital KK, Wealthy British banker Philip Townsend (Baron Townsend of Rathmore) and his wife killed at Estonia holiday home ?44541444? 3/06/12 (JAMAICA) Jamaica’s Financial Services Commission (FSC), Executive director Rohan Barnett, has resigned the position, the Ministry of Finance, Planning and the Public Service announced this afternoon. 3/06/12 (USA PA) USA Technologies Inc Bradley M. Tirpak, a nominee of Shareholder Advocates for Value Enhancement,has resigned from its board subsequent to a settlement agreement with the investing group, according to an SEC filing. Provides a network of wireless non-cash transactions, associated financial/network services and energy management. It provides networked credit card and other non-cash systems in the vending, commercial laundry, hospitality and digital imaging industries. Sterling Green Group PLC became a cash shell following the disposal of their subsidiaries Taxdebts Ltd, Sterling Green (Mortgages) Ltd and the back books of the clients of Sterling Green Ltd. during December 2011. 3/06/12 (UK) Aberdeen Asset Management, non-executive director Gerhard Fusenig has resigned from the board. 3/07/12 (USA) BlackRock Emerging Markets Fund co-head Daniel Tubbs, has left the group to pursue other opportunities. 3/07/12 (HAITI) FORMER DIRECTOR HAITI CENTRAL BANK SLAIN! ?44541444? 3/08/12 (UK) Invesco Trimark Ltd, portfolio managerDana Love has resigned. 3/09/12 (MONGOLIA) Mongol Bank President Alag Batsukh submitted his resignation letter to Speaker of Parliament D. Demberel at the end of last month. He described his reason for resigning as a lack of support by Parliament. 3/09/12 (MONGOLIA) Asia Pacific Securities, General Manager Narantuguldur Saijrakh recently resigned, to focus on his role as Director of Khan Investment Management, investment advisor to the Khan Mongolia Equity Fund – the first open-ended investment vehicle with monthly dealing that invests in Mongolia related equities listed both domestically and internationally. 3/09/12 (Côte d’Ivoire) Banque Central des Etats d’Afrique de l’Ouest (BCEAO) The Ivorian governor of the multi-billion dollar West Africa Francophone bank,Philippe-Henry Dacoury-Tabley, resigned his post. 3/09/12 (UK) Lazard , co-head of investment bankingAlexis de Rosnay quits. De Rosnay specialises in the healthcare sector, he has advised Teva Pharmaceutical and Novartis. 3/09/12 (UK) Deutsche Bank PWM, UK head of portfolio management Martyn Surguy resigned. 3/09/12 (UK) Deutsche Bank PWM, head of discretionary management, Kypros Charalambous, having also stepped down. 3/09/12 (HONG KONG) Bank of America Merrill Lynch,Jimmy Choi, who was in charge of high-yield debt, resigned. 3/09/12 (HONG KONG) Bank of America Merrill Lynch,Leonard Ng, a vice-president in Hong Kong resigned. 3/09/12 (AUSTRALIA) Bank of Queensland CFO Ram Kangatharan plans to leave the bank. 3/10/12 (AUSTRALIA) WESTPAC, Rob Chapman opted to quit running its regional subsidiary St George Bank.